December 2011 - The client has visited us. Clients visited the place of concrete plants production. Were discussed details of plants delivery to Mongolia in 2012. Visiting clients from Lithuania and Ukraine. From 21 till 22 November Semjons Sapkins has visited clients from Lithuania and Ukraine to see the production process and discuss the posibility of mobile concrete plant purchasing. From 8 till 10 August Semjons Sapkins has visited the Benemix company in Riga, Latvia, (www.benemix.com) for discussing of plans for the second half-year of 2011. Together with Latvian partners Semjons Sapkins visited Lithuanian partner Robertas Abramavicius in Klaipeda. 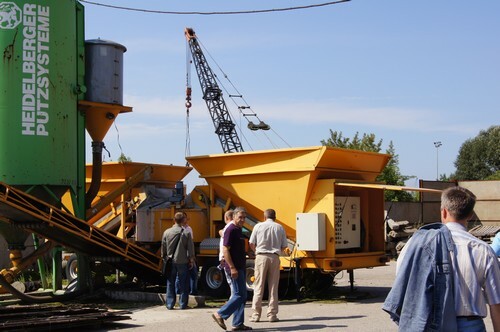 They visited the Latvijas Tilti branch office, where concrete plant Intercon 2200 works. Visiting Akmeni Cementa company in Lithuania. Together with Danish and Latvian partners Semjons Sapkins visited "Akmeni Cementa" company in Lithuania. For the German customers the presentation of earlier delivered plant FAST 30 was held.